With in-depth knowledge and expertise, Epack Polymers Pvt. Ltd., established in 1999; have progressively grown to establish an enviable position of trustworthy manufacturers and suppliers of Prefabricated Industrial Products in the modern industry. Anticipating the demands of various industries, we offer products such as Clean Room Panels, Cold Room and Prefabricated Structure. Being a customer centric organization, we strive to maintain our reputation by improvising our skills and product range and assuring that our customers the best quality products in the market. Furthermore, we ensure easy payment modes, transparent and ethical business dealings with our esteemed clients. Our ability to perform within the realms of engineering and production of industrial products has earned us the reputation of prominent business entity in this industry. We have developed a modern and sophisticated infrastructure facility which is divided into varied sections for the development of the best product line. In addition to this, our experienced team of engineers and other staff works hard to meet every single demand of clients. Ever since our commencement, we have always focused on attaining utmost customer satisfaction through superior product quality. Moreover, we have a separate quality auditing team who scrutinize all our products to ensure that all they reinforce the highest standards of productivity, reliability and quality. Under the guidance of our mentor, Mr. Deendayal Singhania, we have climbed the ladder of success and have created a strong foothold in the market. The company is expanding its wings towards large clientèle and has gained huge success by his effective managing and marketing skills. They all have unmatched knowledge and skills in the respective domain helping us to fulfill the different needs and demands of the clients. They always keep themselves updated with the changing market demands to produce the latest and technically sound range of products. 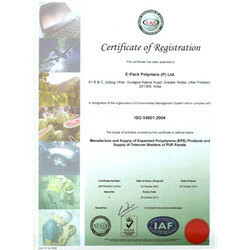 ISO Certifcation for 9001:2008, Quality is accorded top priority to ensure cost effective and timely support to our customers delight. We achieve this by total involvement of our people, continuous improvement and innovations. Our company, E-pack is one of the divisions of East India Group, which has wide product portfolio and a group turnover above 650 Crores. The parent organization East India Group was set up in year 1989, which manufactured EPS Packaging under East India Technologies (P) Ltd. The group formed pool of high value clients in quick tine, which were from electronic and automotive industry with the help of precision and meeting clients’ requirements. With ever-growing success, we established in E-Pack Polymers (P) Ltd. as sole supplier of EPS to LG Electronics in Greater Noida. The firms is also supplying to other prestigious companies, such as Samsung, Panasonic, Honda, Philips and many more. The East India Group set up another unit for electronic manufacturing services in Dehradun as E-durables in 2003. E-Durables now one of the largest and fully backward integrated OEM service provider in the country. E-Durable specializes in plastic molding, sheet metal, circuit board assembly and final product assembly for products like AC, TV, and Microwave mainly for LG Electronics, Haier, Voltas, etc. In 2006, the board of directors of E-Pack expanded into infrastructure development sector, while having main focus on sustainable and energy efficient building structure. E-Pack has broad infrastructure for products like thermally insulated panels, light gauge steel framing, PEB structures etc. The group also provides their products and services for chemical earthing, Lightning arresters under the brand name of Ennov Infra Solutions. 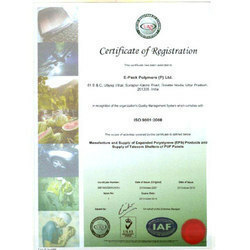 ISO Certifcation for 14001:2004, Quality is accorded top priority to ensure cost effective and timely support to our customers delight. We achieve this by total involvement of our people, continuous improvement and innovations. E-Pack is one of the leading providers of turnkey solution for innovative and efficient building materials and packaging solutions. Organization principal activity comprises of Insulated sandwich panel manufacturing, Light Gauge steel framing and protective Foam packaging. 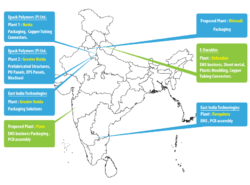 Since the inception of E-Pack in 1999 at a prime location in Greater Noida E-Pack has been the leading manufacturer of EPS in India producing more than 10,000 Tons per annum and covered over 1.5millions square feet in Prefab structures around the world. To nurture lasting customer relationships by anticipating needs and delivering beyond expectations.To continuously improve our cost stewardship in the value chain.To analyse customers’ needs and come up with innovative products.To prepare and groom the next generation of young thinkers.To market value added branded products in the domestic and global markets.To “Grow with the Best” customers, suppliers, financial institutions, employees and other stake holders.